Nov. 27, 2005 - A postcard from our archives, showing the Ackley covered bridge, built in 1832 across Wheeling Creek, connecting Washington and Greene Counties, is published in the "Focus" Magazine of the Pittsburgh Tribune-Review. The bridge was moved to Henry Ford's Greenfield Village in 1937, where it can be seen today. The image may be seen in the Minerd.com biography of Henry and Polly (Younkin) Minerd. October 2005 - Families of Fayette County, the quarterly publication of the Fayette County (PA) Genealogical Society, features the article, "Minerd.com Website Launches 'Online Quilt Museum'." October 2005 - "Tontongany's Deep Secret" -- the groundbreaking Minerd.com story of Thomas C. "Tommy" Custer -- who was the son of Civil War Medal of Honor winner Thomas Ward Custer and the nephew of General George Armstrong Custer -- is published nationally in the Research Review Magazine of the Little Big Horn Associates. Authored by Minerd.com founder Mark A. Miner, the 11-page article is illustrated with more than 20 rare photographs and images. It tells the story of Tommy, his mother Rebecca Minerd and his famous father, and how the community of Tontogany, Ohio harbored the deep Custer family secret "which everyone knew but no one publicly discussed." In the preface, the magazine editor writes that the article reveals "documents, photos, newspaper articles and more in examining the only recently discovered evidence regarding Tom Custer's son... It presents an interesting insight into nineteenth century handling of illegitimate children." Click here to order a copy. Oct. 16, 2005 - Undated postcard from our archives, showing the famed "Hangover" cabin that Pititsburgh department store owners Liliane and Edgar J. Kaufmann Sr. constructed circa 1921 for use as a weekend retreat at Bear Run, Fayette County, is published in the "Focus" Magazine of the Pittsburgh Tribune-Review. The house sat about 1,500 feet southeast of the Bear Run Falls where the Kaufmanns later build their world famous home, Fallingwater, designed by Frank Lloyd Wright. Sept. 24, 2005 - Seen at right, Minerd.com is featured with a display table at the annual Dunbar-Fest sponsored by the Dunbar (PA) Historical Society, including photos from our website and publications from past reunions. Cousins from several branches of the family stop by to visit with website founder Mark A. Miner. Sept. 11, 2005 - Postcard from our archives, from the early 1910s, showing the Main Street of Mt. Pleasant, PA, looking eastward, is published in the "Focus" Magazine of the Pittsburgh Tribune-Review. Sept. 2005 - Minerd.com and its founder, Mark A. Miner, are acknowledged as sources in the newly published book seen at left, There's No Place Like Dunbar! 2002-2004 - Historical Vignettes and Personal Reflections from The Daily Courier's Dunbar Column, authored by Donna R. Myers and Bonnie L. Zurick of the Dunbar (PA) Historical Society. This is the third book published to date citing Minerd.com as a resource. In the dedication, they wrote: "A very special thanks to ... the nationally recognized www.minerd.com website, for encouraging us and sharing glimpses of his family's ties to the Dunbar community." July 24, 2005 - Postcard from our archives, postmarked 1908 and showing the Soldiers' Orphans School in Jumonville, near Uniontown, PA, is published in the "Focus" Magazine of the Pittsburgh Tribune-Review. July 12, 2005 - Minerd.com founder Mark A. Miner is invited to speak at the 2007 national conference of the Little Big Horn Associates to be held in North Platte, Neb., on July 21, 2007. The topic will be Miner's research of General George A. Custer's little-known nephew, Thomas C. Custer. July 8, 2005 - The national Minerd-Minard-Miner-Minor Reunion is featured in a Somerset (PA) Daily American article, " 'A Legacy of Quilting' Reunion's Theme." June 12, 2005 - Postcard from our archives, postmarked 1912 and depicting the main pavilion at Washington Park in Washington, PA, is published in the "Focus" Magazine of the Pittsburgh Tribune-Review. April 24, 2005 - Postcard from our archives, postmarked 1910, showing a bird's-eye view of the railroad yards at Dickerson Run, Fayette County, is published in the "Focus" Magazine of the Pittsburgh Tribune-Review. March 2005 - The 740-page book, George Fluckey the Hessian Soldier, is published by authors Lois Catlett and Sharon (Catlett) Kossieck. It contains extensive excerpts of Minerd.com biographies of Daniel and Margaret (Fluckey) Miner Sr. and their descendants of Cardington, Morrow County, OH. Minerd.com is credited as the source throughout the volume. Feb. 27, 2005 - Postcard from our archives, dated 1909 and depicting the "largest gas pumping station in the world," at Brave, Greene County, PA, is published in the "Focus" Magazine of the Pittsburgh Tribune-Review. Jan. 2, 2005 - As part of a cover story about Western Pennsylvania's "Old Coal Kings," the "Focus" Magazine of the Pittsburgh Tribune-Review publishes an undated postcard from our archives, showing the coal tipple of the H.C. Frick Coke Co. in South Brownsville, Fayette County. Nov. 7, 2004 - Undated postcard from our archives, showing the historic West Brownsville, PA birthplace of James G. Blaine, who served in the U.S. House and Senate, and was a presidential candidate in 1884, is published in the "Focus" Magazine of the Pittsburgh Tribune-Review. Sept. 26, 2004 - Undated postcard from our archives, showing Spray Rock Cottage at Bear Run, Fayette County, owned by the Edgar J. Kaufmann department store family, and demolished in the 1930s to make room for what is now the guest house at Fallingwater, is published in the "Focus" Magazine of the Pittsburgh Tribune-Review. Aug. 22, 2004 - Postcard from our archives, postmarked 1918 and entitled "General View of Rochester, Pa.," is published in the "Focus" Magazine of the Pittsburgh Tribune-Review. July 8, 2004 - An Associated Press wire story about our reunion is sent to scores of newspapers throughout Pennsylvania. The article is published in the Harrisburg Patriot-News, Beaver County Times, Uniontown Herald-Standard, Connellsville Daily Courier, Johnstown Tribune-Democrat, Waynesboro Record-Herald and Wilkes-Barre Times-Leader, among others. June 27, 2004 - Undated postcard from our archives, depicting the Leisenring No. 1 coke plant of the H.C. Frick Coke Co. near Uniontown, is published in the "Focus" Magazine of the Pittsburgh Tribune-Review. May 16, 2004 - Postcard from our archives, dated 1918 and entitled "Scenes Along the Baltimore and Ohio Railroad" on the Youghiogheny River at Indian Creek, Fayette County, PA, is published in the "Focus" Magazine of the Pittsburgh Tribune-Review. March 28, 2004 - Postcard from our archives, of the "Triumphal Arch, Washington, Pa., Centennial Oct. 2-8, 1910," is published in the "Focus" Magazine of the Pittsburgh Tribune-Review. March 7, 2004 - Postcard from our archives, postmarked 1909 and showing Main Street looking west in Connellsville, Fayette County, PA, is published in the "Focus" Magazine of the Pittsburgh Tribune-Review. 2003 - Minerd.com's biography of left-handed fiddler Fred Younkin is referenced in the book, Playing Violin and Fiddle Left-Handed, authored by Ryan Thomson. See www.captainfiddle.com for more. Dec. 28, 2003 - Undated postcard from our archives, showing the Pennsylvania Railroad station and Westinghouse Air Brake Works at Wilmerding, PA, is published in the "Focus" Magazine of the Pittsburgh Tribune-Review. Dec. 14, 2003 - Postcard from our archives, postmarked 1912 and showing the refreshment pavilion at Killarney Park (now Camp Christian) along the Indian Creek Valley Railway near Mill Run, Fayette County, is published in the "Focus" Magazine of the Pittsburgh Tribune-Review. Dec. 2003 - The Little Big Horn Newsletter of the Little Big Horn Associates publishes a summary of our bus tour of Custer-Minerd homes near Tontogany, OH. See entry for Oct. 25, 2003. Nov. 2, 2003 - Undated postcard from our archives, a view of the Atlas Glass Plant in Washington, PA, is published in the "Focus" Magazine of the Pittsburgh Tribune-Review. Oct. 25. 2003 - Beverly (Hansen) Miner and Mark A. Miner lead a lecture and bus tour for 75 attendees of the Great Lakes Conference of the Little Big Horn Associates. The event covers our groundbreaking Minerd.com research of the life of Thomas C. Custer (1871?-1896), the son of Rebecca Minerd and Capt. Thomas Ward Custer, and nephew of Gen. George Armstrong Custer. A special booklet is published (seen here), entitled The Custers in Wood County, Ohio. The tour also features remarks by Steve Alexander (seen at right), the nation's foremost Gen. Custer reenactor and living historian who actually owns and resides in the General's former home in Monroe, MI. The Tommy Custer story is later featured in several western Ohio newspaper articles and is taped for possible broadcast on HPAC2, the Hastings Public Access Channel 2 in Michigan. Oct. 14, 2003 - The Pittsburg (KS) Morning Sun publishes "Local Couple Attends Reunion," a story about a branch of our cousins who came to our 2002 and 2003 reunions, the first of their immediate family to return from Kansas to Western Pennsylvania in 116 years. Oct. 14, 2003 - The Ohio Bicentennial Commission grants permission for Minerd.com to use its special logo on our Ohio Bicentennial webpage. Sept. 21, 2003 - Undated postcard from our archives, showing Shady Grove Park between Connellsville and Uniontown, PA, site of our clan's reunion in 1930, is published in the "Focus" Magazine of the Pittsburgh Tribune-Review. Sept. 2003 - The Little Big Horn Newsletter of the Little Big Horn Associates publishes an article about the upcoming Oct. 25, 2003 Great Lakes Conference in Perrysburg, OH, featuring a bus tour of Custer-Minerd homes near Tontogany, to be presented by Beverly (Hansen) Miner, a volunteer with the Wood County Chapter of the Ohio Genealogical Society, and Mark Miner, founder of Minerd.com, on the topic of "Family Oral History of Rebecca Minerd and Tom Custer." Aug. 10, 2003 - Postcard from our archives, postmarked 1935, a bird's-eye view of the Pennsylvania Railroad station at Greensburg, PA, is published in the "Focus" Magazine of the Pittsburgh Tribune-Review. July 18-20, 2003 - The Everson (PA) Centennial Booklet -- 100 Years of Its Town & People 1903-2003 -- features two photographs from our archives, including one on the cover showing a local coal tipple. The centennial weekend celebration drew hundreds of spectators. July 2003 - The Families of Fayette County newsletter of the Fayette County (PA) Genealogical Society publishes a notice of our reunion and our "top 10 family websites" award. July 6, 2003 - The Uniontown (PA) Herald-Standard publishes a feature story about our upcoming national reunion, "90th Reunion Includes Dedication." The article begins, "If you are one of the 40,000 or more descendants of Jacob Minerd, you probably will be at the 90th anniversary of the first Minerd reunion in Western Pennsylvania on July 12-13." July 6, 2003 - Postcard from our archives, postmarked 1910, showing Allegheny General Hospital on Pittsburgh's North Side (then known as Allegheny City), is published in the "Focus" Magazine of the Pittsburgh Tribune-Review. July 5, 2003 - The Somerset (PA) Daily American prints a story about our upcoming national reunion entitled "Marker to Honor War Veteran." July 5, 2003 - The Connellsville (PA) Daily Courier reports on our upcoming national reunion in a story entitled "Marker Dedicated." June 2003 - "Unk Hiram," also known as Bill Hocutt of Texas, a well-known and self-styled genealogy commentator and web-publisher, has named Minerd.com as his "Site of the Month Award" for the month of June. Click here to visit his site and read his thought-provoking "Adventures in Genealogy" columns. May 25, 2003 - Postcard from our archives, dated 1907, showing the coal tipple at the York Run Mines of the H.C. Frick Coke Co., near Uniontown, PA, is published in the "Focus" Magazine of the Pittsburgh Tribune-Review. April 27, 2003 - The Greensburg (PA) Tribune-Review(Fay-West Edition) carries a major feature article, "Minerd-Miner-Minor," reporting on our "Top 10" website award and upcoming national reunion honoring Revolutionary War veteran Jacob Minerd Sr. (father of us all). Calling our site "one of the best," the article said that the "Minerd family, whose members have spread all over the world, has been brought closer to its Fayette County roots through a Web site." 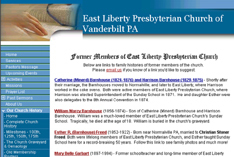 April 10, 2003 - In a newly created "Former Members" page on the website of the East Liberty Presbyterian Church of near Vanderbilt, Fayette County, PA, historical congregation members in our family are mentioned prominently and are linked to their respective biographies on our website. April 2003 - The Little Big Horn Newsletter publishes a notice of the upcoming October 2003 tour of Custer-Minerd homeplaces in Wood County, OH, led by Beverly (Hansen) Miner, at the Great Lakes Conference of the Little Big Horn Associates. April 12, 2003 - Our Reunion Treasurer Doris (Sands) Hawker gives a presentation on the 'Minerd-Custer Family Connection' to the Zackquill Morgan Chapter of the Daughters of the American Revolution in Morgantown, WV. April 9, 2003 - The 'Dunbar History Moment' column of the Connellsville (PA) Daily Courier reports on our research of ill-fated John J.P. Hoye, husband of Louisa Minerd, who tragically was killed in a Baltimore & Ohio Railroad accident in Fayette County, PA in December 1902. April 6, 2003 - Postcard from our archives, dated 1912, showing the viaduct of the Western Maryland Railroad near Meyersdale, Somerset County, PA, is published in the "Focus" Magazine of the Pittsburgh Tribune-Review. April 1, 2003 - Reunion president and Minerd.com founder Mark A. Miner appears before Uniontown (PA) City Council to request an Official Proclamation of next July 12-13, 2003, as "Jacob Minerd Weekend" in Uniontown, to coincide with our annual reunion. This was reported the next day in the Connellsville (PA) Daily Courier and broadcast on the local cable TV news. April 2003 - The April issue of Family Tree Magazine names Minerd.com one of its "Top 10 Family Websites" in the nation, with the editors "scouring the web until our eyes ached and our mouse-clicking fingers cramped." Wrote editor Crystal Conde, "Today's Minerd-Miner-Minor kin will find an astonishing amount of their history here." March 6, 2003 - The Somerset (PA) Daily American publishes "Minerd.com Earns National Honors," highlighting our "Top 10" award, and notes that the site last year "received more than 84,000 'hits' and fielded inquiries from more than 200 first-time visitors." March 5, 2003 - Minerd.com's "Top 10" award is featured in the "Dunbar Social News" column of the Connellsville (PA) Daily Courier, stating that "Dunbar has some close ties with the Miner-Minerd-Minor family, whose descendants still live in and around the Dunbar area..."
March 2, 2003 - In "Genealogy Site Honored," the Uniontown (PA) Herald-Standard reports on Minerd.com's "Top 10" award, noting that the site was selected after an "exhaustive search" of the Internet by the editors of Family Tree Magazine. The story notes our "encyclopedic biographies ... of cousins ranging from pioneer settlers, Civil War soldiers and coal miners to physicians, business leaders and social servants." Feb. 22, 2003 - The Pittsburgh Post-Gazette publishes a major feature about Minerd.com's "Top 10" award, entitled "Reunion Organizer Keeps the Tree Alive with Internet Site." The article credits the site's "abundance of information ... clean design and easy navigation," adding that it is an "educational tool that lets tens of thousands of people around the world know that their roots can be traced back to Western Pennsylvania." Feb. 18, 2003 - Bill Irion, Director of the Research Center for Beaver County and Local History, and Minerd.com founder Mark Miner jointly presented "Researching Your Roots on the Web" at a meeting of the Beaver Area Heritage Foundation, at Trinity Episcopal Church in Beaver, PA. The group "surfed the web" together in an online demonstration, with web images projected "live" onto a large screen. Feb. 16, 2003 - Postcard from our archives, circa 1908, showing the old Jacksonville Fair Grounds at Wind Ridge, site of the famed annual Jacktown Fair of Greene County, PA, is printed in the "Focus" Magazine of the Pittsburgh Tribune-Review. Jan. 19, 2003 - Postcard from our archives, showing the Fayette County (PA) grave of French Ensign Coulon de villiers, sieur de Jumonville, is printed in the "Focus" Magazine of the Pittsburgh Tribune-Review. Jumonville's ambush-death in 1754, at the hands of British troops led by young Maj. Gen. George Washington, incited the French and Indian War. Dec. 27, 2002 - The Chillicothe (OH) Gazette publishes a feature story about our new "Ohio Bicentennial" page, entitled "Web Site Aims to Spur Interest in Genealogy." Dec. 22, 2002 - Postcard from our archives, showing the Old Main Building at the South-Western State Normal School, now California University of Pennsylvania, is printed in the "Focus" Magazine of the Pittsburgh Tribune-Review. Dec. 8, 2002 - Postcard from our archives, showing the Civil War Soldiers Monument and the Somerset County (PA) Courthouse, is printed in the "Focus" Magazine of the Pittsburgh Tribune-Review. Nov. 24, 2002 - Postcard from our archives, showing Pittsburgh Steel's blast furnaces at Monessen, PA, is printed in the "Focus" Magazine of the Pittsburgh Tribune-Review. Nov. 14, 2002 - Florida's St. Petersburg Times profiles Minerd.com in "Family Web Sites Help You Find the Past in Cyberspace," praising our site as a model for others to follow, and calling it "a great job ... that is informative, educational and interesting." The piece is authored by Donna Murray Allen. Nov. 3, 2002 - Postcard from our archives showing the grand entrance to Ferncliff Park at the long-since demolished Ferncliff Hotel in Ohiopyle, PA, site of the first annual Minerd Reunion in 1913, is printed in the "Focus" Magazine of the Pittsburgh Tribune-Review. Oct. 29, 2002 - The Connellsville (PA) Daily Courier prints "Report Available" about the release of our publication on the Lynn Point Cemetery cleanup and mapping project. Oct. 23, 2002 - In its "Dunbar History Moment" column, the Connellsville (PA) Daily Courier publishes "Minerva Minerd and the the Ladies Aid Quilt," quoting extensively from our web-biography of Minerva (Bodkin) Minerd. Oct. 15, 2002 - Minerd.com was the featured topic at a North Hills Genealogists meeting in Pittsburgh at the Northland Public Library. A special "website within a website" was shown live by founder Mark A. Miner during the presentation using the library's computer, project and wireless online connection. Oct. 6, 2002 - Postcard of Woodlawn, PA (now known as Aliquippa), postmarked 1910 and from our archives, is printed in the "Focus" Magazine of the Pittsburgh Tribune-Review. October 2002 - The Arsenal newsletter of the Greater Pittsburgh Civil War Round Table cites our "excellent website" and says "It keeps getting better all the time!" October 2002 - Our formal report on the Lynn Point Cemetery Project is published, with the Minerd.com name on the front cover, and sent to local libraries and historical societies in Western Pennsylvania. Sept. 28, 2002 - The Moments in Dunbar History booklet, a collection of articles from the Connellsville (PA) Daily Courier and published for the Dunbar Community Fest, includes a reprint of the June 19, 2002 article entitled "Dunbar History: The Minerd-Miner-Minor Clan," by Donna Myers and Bonnie Lee Zurick. Sept. 2002 - In a full-page story, the newsletter of Pittsburgh's North Hills Genealogists group profiles our website prior to the Oct. 15, 2002 "live" presentation at the Northland Public Library. Sept. 15, 2002 - Postcard of Waynesburg College's main administration building circa 1908, from our archives, is printed in a special Waynesburg edition of the "Focus" Magazine of the Pittsburgh Tribune-Review. Sept.-Oct. 2002 - Minerd.com's founder publishes a short review of Carl Day's 2002 book, Tom Custer: Ride to Glory, in the Newsletter of the Wood County Chapter of the Ohio Genealogical Society. Summer 2002 - The Perry County Heirlines newsletter of the Perry County Chapter, Ohio Genealogical Society, cites our web-biography of Elizabeth 'Lizzie' (Miner) Lytle. Aug. 25, 2002 - Postcard of the Pittsburgh railroad transfer yards at Pitcairn, PA, from our archives, is printed in the "Focus" Magazine of the Pittsburgh Tribune-Review. July 11, 2002 - The Oakland (MD) Republican publishes "Minerd-Miner-Minor Reunion to Host Author." July 10, 2002 - Minerd.com's "Best Site Pick" Award is featured in the "Out on the Town" social column in the Connellsville (PA) Daily Courier, stating that "The site is a wonderful genealogy resource and family history site..."
July 8, 2002 - In "Author to Speak," the Connellsville (PA) Daily Courier reports on our upcoming reunion featuring Carl Day and the 'Custer Connection,' saying "This year's theme is part of ongoing research to measure the long-term impact of the clan on society." July 1, 2002 - Minerd.com receives the "Best Site Pick" Award by the Golden Gate Genealogy Forum, a large, popular genealogy forum based in Franklin, MA. Golden Gate selects only one site each month, and other past winners have included Cyndi's List and the US GenWeb Project, among many others. June 19, 2002 - In its "Dunbar History Moment" column, the Connellsville (PA) Daily Courier publishes a feature about our "extensive website" as well as "some of the family's Dunbar personalities ... who have contributed in some way to our town's history." It added that "This column is far too short to convey the full impact this family has had on Dunbar." June 15, 2002 - Turn of the century postcard view of Pittsburgh's North Side, including Exposition Park, home of the baseball Pirates until 1909, is printed in the "Focus" Magazine of the Pittsburgh Tribune-Review. June 2002 - The newsletters of the Western Pennsylvania Civil War Round Table and Greater Pittsburgh Civil War Round Table publish notices of "The Custer Connection," our upcoming national reunion. May 12, 2002 - Postcard of the Pittsburgh and Lake Erie Railroad bridge, spanning the Ohio River between Beaver and Monaca, PA, from our archives, is printed in the "Focus" Magazine of the Pittsburgh Tribune-Review. April 14, 2002 - Postcard of a bird's-eye view of Ursina, Somerset County, PA, dated 1909, from our archives, is printed in the "Focus" Magazine of the Pittsburgh Tribune-Review. March 26, 2002 - A national Thomas Ward Custer website, maintained by Rosemary and Darroll Pardoe, calls our Custer-Minerd pages "fascinating ... [a] very interesting site." March 10, 2002 - Postcard of the Holy Ghost Orthodox Church in Ambridge, PA, from our archives, is printed in the "Focus" Magazine of the Pittsburgh Tribune-Review. Feb. 17, 2002 - Postcard of the Carnegie Steel mills at 33rd Street in Pittsburgh, from our archives, is printed in the "Focus" Magazine of the Pittsburgh Tribune-Review. Jan. 24, 2002 - The Philadelphia County GenWeb Project calls our Keep Sweet! memoir by the late Dr. Roy S. Minerd "A must read!!" and has added a link on the site's main page. Jan. 20, 2002 - Postcard of Forbes Field in Pittsburgh, from our archives, is printed in the "Focus" Magazine of the Pittsburgh Tribune-Review. 2002 - Our biography of Judge Byron W. Langdon is listed and linked on the Tippecanoe County, Indiana Biographies Index. Dec. 2, 2001 - Postcard of Braddock's Grave at Chalk Hill, near Uniontown, PA, from our archives, is printed in the "Focus" Magazine of the Pittsburgh Tribune-Review. Sept. 30, 2001 - Postcard of Carnegie Steel workers pouring molten steel in Pittsburgh, from our archives, is printed in the "Focus" Magazine of the Pittsburgh Tribune-Review. Aug. 26, 2001 - Postcard of the Phillips Coke Works of Uniontown, PA, from our archives, is printed in the "Focus" Magazine of the Pittsburgh Tribune-Review. Aug. 5, 2001 - Postcard of the Summit Hotel of Uniontown, PA, from our archives, is printed in the "Focus" Magazine of the Pittsburgh Tribune-Review. Aug. 1, 2001 - Minerd.com is mentioned on the national e-zine, Missing Links: RootsWEb's Genealogy Journal, Vol. 6, No. 31, with a circulation of close to 853,000. July 26, 2001 - The New Republic of Somerset County, PA publishes "Record Crowd at Minerd-Miner-Minor Reunion." July 25, 2001 - The Connellsville Daily Courier prints a story about our reunion, headlined "Minerd-Miner-Minor." July 2001 - Families of Fayette County (Fayette County [PA] Genealogical Society) publishes "Innovative History Website Celebrates 1st Anniversary." July 8, 2001 - Postcard of the Beaver County (PA) Courthouse, from our archives, is published in the "Focus" Magazine of the Pittsburgh Tribune-Review. July 5, 2001 - Minerd.com is featured in a full-page story, "Long-Lost Cousins: Researching the Huge Miner-Minor-Minerd Family Tree Can Lead to Discovery of Thousands of Formerly Unknown Relatives," in the Uniontown (PA) Herald-Standard, the daily newspaper in the county seat of our family's founding in Western Pennsylvania. June 10, 2001 - Postcard of the Springfield Pike (Route 711) near Connellsville, PA, from our archives, is published in the "Focus" Magazine of the Pittsburgh Tribune-Review. May 2001 - Minerd.com is listed on the popular Pittsburgh.Com website in the "LookSmart Pittsburgh - People & Chat - Personal Homepages" category. May 12, 2001 - "A Helping Hand: Ancestors Work to Recover, Renovate Family Cemetery." Feature article in the Connellsville Daily Courier. May 6, 2001 - Postcard showing Washington Park in Washington, PA, from our archives, is published in the "Focus" Magazine of the Pittsburgh Tribune-Review. April 15, 2001 - Postcard showing old Connellsville (PA) coke ovens, from our family archives, is published in the "Focus" Magazine of the Pittsburgh Tribune-Review. April 13, 2001 - Story in the Connellsville Daily Courier about our upcoming cleanup of the overgrown Lynn Point Cemetery near Dunbar, PA.
March 31, 2001 - Minerd.com is mentioned in Donna Murray Allen's genealogy column in Florida's St. Petersburg Times. Dec. 2000 - For the first time, Minerd.com is cited as a reference in a published book, Means Genealogy, by Deborah Harris. Nov. 27, 2000 - Minerd.com is featured in a speech on "Unitedly Union" at the Civil War Round Table of Greater Pittsburgh. Oct. 9, 2000 - A front page feature article, "Beaver Man Resolves to 'Meet' at Least An Ancestor Each Month," is published in the Beaver County (PA) Times. June 10, 2000 - Minerd.com founder makes a presentation on "The Power of Memory" at the Celebrate the Centuries" event at Smithfield, PA.
June 2, 2000 - Minerd.com is listed on the nationally known Cyndi's List website. Fall 1999 - "Al-Ed-Ha: Fayette County's Forgotten 'Mountain Poet'," is the cover story of Western Pennsylvania History Magazine of the Historical Society of Western Pennsylvania. Aug. 1, 1999 - "One Fayette Family Yields Two Centuries' Worth of Achievements." Guest column in the Uniontown (PA) Herald-Standard. July 31, 1999 - "Charting a Family's Impact." Guest column in the Pittsburgh Post-Gazette.